Ames, Iowa – The arrival of spring brings the hustle and bustle of construction work. 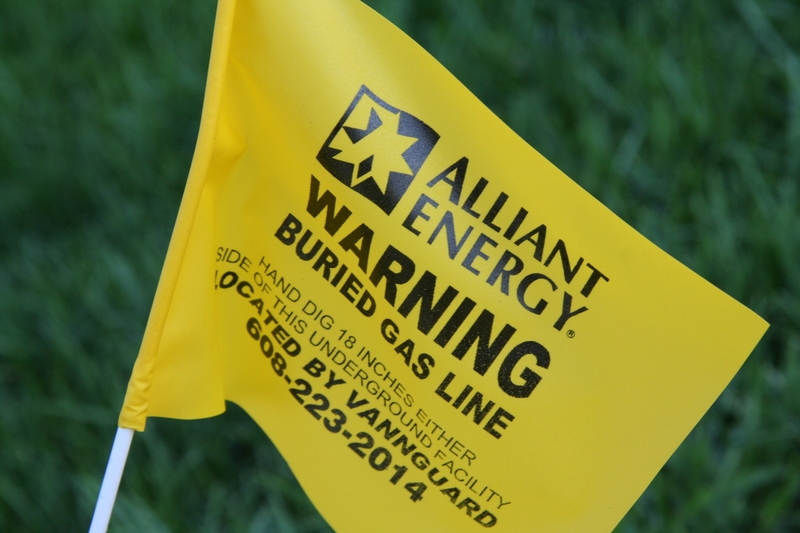 Our company will begin major natural gas system renovation projects in Ames this week. Work is slated to begin in Ames this week. Construction will involve 19 different natural gas system projects with a total investment of approximately $3 million. Projects will include upgrading and replacing existing distribution natural gas pipelines and other equipment currently serving homes and businesses. Intercon Energy Services is the contractor for the projects. Construction is expected to be completed in November. Our company also expects to begin work to upgrade the natural gas distribution systems in Boone and Nevada this spring. Anyone interested in receiving natural gas service in Ames that currently does not have service should call us at 1-888-255-4254 for more information on making the switch to natural gas service. Dubuque, Iowa – Blain’s Farm and Fleet is connecting with its Dubuque area customers through energy efficiency. The company recently opened a new 121,000 square foot store in Dubuque. Blain’s Farm and Fleet installed energy-efficient lighting with occupancy controls and daylighting dimming; building insulation; window glazing and heating and cooling technologies. Check presentation participants (from left to right): Jo Blakeman, Blain’s Dubuque assistant store manager trainee; Traci Handel, Blain’s Dubuque assistant store manager, Craig Clefisch, Alliant Energy key account manager, Dave Wynn, Blain’s construction project manager, Neal VanLoo, Blain’s director of engineering, Bill Schendt, Blain’s director of finance, Amanda Kinsel, Blain’s Dubuque store manager, Dan Wagner, Blain’s assistant store manager, Tim Madole, Blain’s regional manager. Blain’s Farm and Fleet expects to save more than 543,400 kilowatt-hours therms of electricity per year. The annual environmental impact is equivalent to reducing oil consumption by 871 barrels or 134 tons of landfill waste per year. 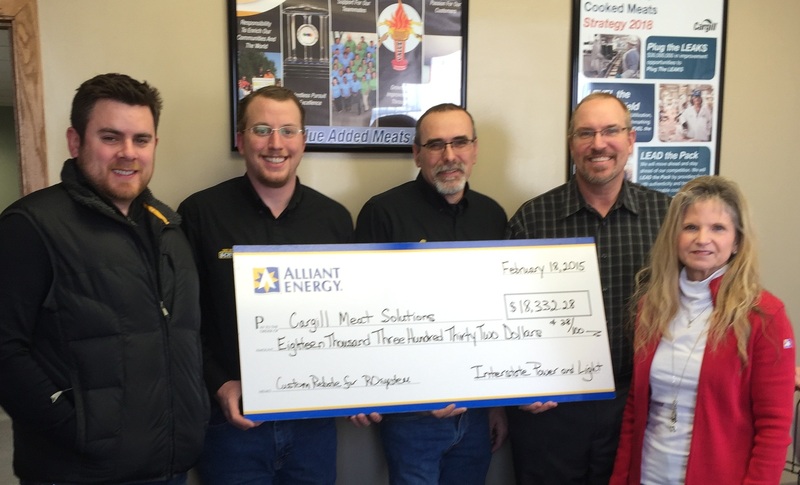 In addition to energy and cost savings, Blain’s Farm and Fleet received a rebate of $92,381 through Alliant Energy’s Commercial New Construction program. MADISON, Wis. – We’re making a donation of $2 million to our Hometown Care Energy Fund, which helps income-eligible customers across Alliant Energy’s service area keep up with heating costs. Our Hometown Care Energy Fund collects donations from Alliant Energy shareowners, employees, retirees and customers. Over the past year, our customers, employees and retirees gave more than $250,000 through optional contributions. Alliant Energy’s contribution of $2 million comes from shareowners and is not included in the rates charged to utility customers. Donations are distributed by community action agencies in Iowa and Minnesota and by Energy Services Inc.’s Keep Wisconsin Warm/Cool Fund in Wisconsin. The funds will be dispersed to the agencies this month. For more information on the Hometown Care Energy Fund, visit alliantenergy.com/hometowncare. In the last week, one of the famous Decorah Eaglets was killed on one of our poles in rural Keokuk County. It was about 150 miles from where it hatched, and in a part of the state where we haven’t seen many eagles in the past. We want our customers and fellow Iowans to know that we are saddened by this event, and we are taking more steps to protect the eagles and other wildlife in our territory. When we built our lines in this area of rural Keokuk County, we installed animal protection for the expected wildlife, which at the time did not include eagles. However, in recent years, the eagle population has grown in non-traditional areas like this because of newer livestock farming operations, which provide sources of food for the eagles. We are learning from this, and our crews have already started working to install equipment to protect eagles and other birds in the area. As part of our long-standing Avian Protection Plan, we will add special line covers and anti-perching devices in this area. We will install this equipment as soon as it is ready, which could be as soon as the next week or two. We have used this equipment in many other parts of the state. This incident was a new situation for us, and we are going to carefully study how we can identify other non-typical places that could become areas of concern as the population of eagles continues to flourish in Iowa. We appreciate the work of the Raptor Resource Project, located in Decorah, and hope to work together to share the lessons learned from these developments with others. Cedar Rapids, Iowa – Reverse-osmosis? It sounds like something from a science fiction novel, but Cargill’s meat processing plant in Albert Lea, Minnesota, is using it to reduce energy costs and their impact on the environment. The company installed a reverse-osmosis system in the facility, which removes solids from the boiler. As a result, the system reduces the water and heat needed to complete the production process. Cargill expects to save more than 17,000 therms of natural gas per year. The environmental impact of the reverse-osmosis system is the equivalent to removing 19 passenger vehicles from Iowa roadways or the amount of carbon dioxide sequestered by nearly 74 acres of forest in the United States. Check presentation participants (from left to right): Greg White, Cargill controller; Brad Brouwers, Cargill utilities supervisor; Gerald Mason, Cargill plant and maintenance manager; Kevin Saxton, Cargill general manager and Rebecca Gisel, Alliant Energy key account manager. In addition to energy and cost savings, Cargill received a rebate of $18,332 through our company’s Custom Rebates program. 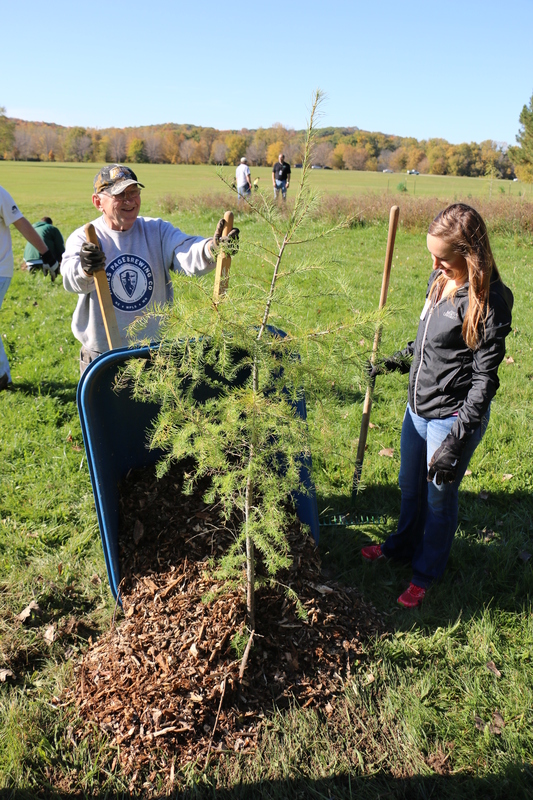 Volunteers across Iowa will soon make a major impact on their hometown by planting new trees. This spring, we are working with Trees Forever to fund $181,923 for 44 tree planting projects. These projects are part of the Branching Out program and are listed below. Volunteers plant trees as part of Branching Out in Cedar Rapids, IA in 2014. Branching Out is a team effort. We provide the funding and local community leaders create each tree-planting project. Experts from Trees Forever help with many parts of the project, especially making sure designs help improve energy-efficiency and that trees are planted correctly. As of this spring, volunteers have planted trees as part of Branching Out for 25 years. The work has improved energy efficiency across the state. Trees block the sun on hot days and the wind on cold days. Trees also improve the environment by capturing carbon. Trees provide many benefits that increase as they grow. To help trees last a long time, it is important to plant and care for them properly. With the threat of Emerald Ash Borer, Japanese beetles, Gypsy moth, Bur Oak Blight and others, the need for a diverse population of trees is important across Iowa. Marion $5,250 Plantings on the north and south sides of Tower Terrace Road from 10th St. to 3rd St. Trees Forever is a nonprofit organization with a mission to plant and care for trees and the environment. Trees Forever has involved over 150,000 volunteers in projects that improve air and water quality, increase wildlife habitat, provide substantial energy savings and beautify our landscape. Alliant Energy Corporation’s Iowa and Minnesota utility subsidiary, Interstate Power and Light Company (IPL), utilizes the trade name of Alliant Energy. The Iowa and Minnesota utility is based in Cedar Rapids, Iowa, and provides electric service to 530,000 customers and natural gas service to 235,000 customers in over 700 communities. The employees of Alliant Energy focus on delivering the energy and exceptional service their customers and communities expect – safely, efficiently, and responsibly. Visit alliantenergy.com or call 1-800-ALLIANT (800-255-4268) for more information. Alliant Energy Corporation is traded on the New York Stock Exchange under the symbol LNT. 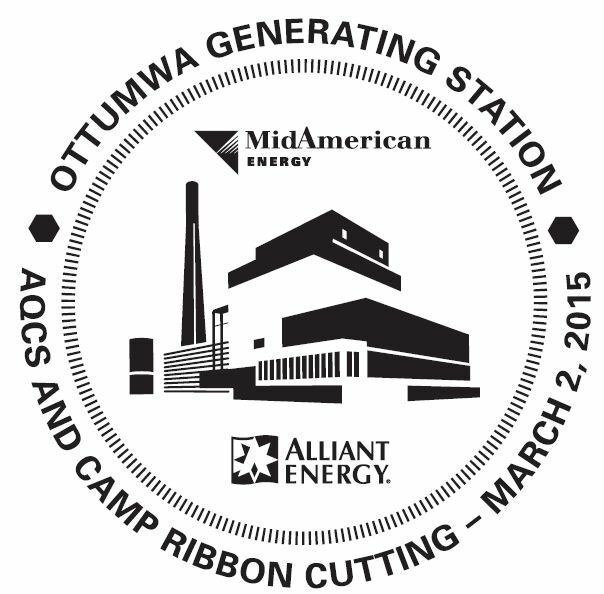 OTTUMWA, Iowa – Our company’s Iowa utility recently completed projects at the Ottumwa Generating Station (OGS) that are reducing emissions and making Iowa’s air cleaner. 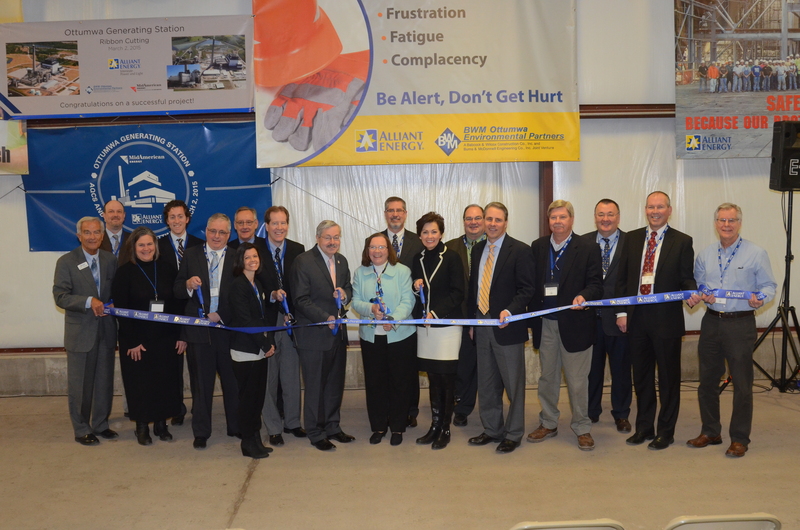 Local and state leaders, labor partners and project contractors joined our company and our OGS co-owner, MidAmerican Energy, to celebrate the completion of a $491 million comprehensive air quality control project and other efficiency upgrades at the facility. Construction began in the second quarter of 2012 and included installation of a baghouse and scrubber technology. The technology is designed to reduce emissions of sulfur dioxide and mercury by 90 percent. It will also meet pending Environmental Protection Agency emissions regulations. In addition, new equipment installed at the facility is expected to result in the OGS producing more energy while using less fuel. The projects also created a positive economic development impact. At the peak of construction more than 800 skilled-labor workers logged more than 1,900,000 hours to complete the projects. The projects required more than 7,800 cubic yards of concrete poured and 7,900 tons of steel. Since 2005, our company has reduced emissions output at a number of generating stations, reducing its generating fleet’s CO2 output by approximately 15 percent. We expect to fuel-switch or retire more than 1,400 megawatts of the company’s fossil-fueled generation by 2020.